Physical time reaction propagation library in D. Based on the Gillespie algorithm of 1977 it contains various implementations and enhancements for fast reaction index and timing sampling. This repository contains a physical, stochastic time reaction propagation library in D. Based on the Gillespie algorithm of 1977 it contains various implementations and enhancements for fast reaction index and timing sampling. The algorithm models the time and reaction evolution as stated by Gillespie, see  and . After , all properly or rather "related to the intended master equation" formulated algorithms, modelling physical time propagation algorithms are equivalent. This concerns algorithms with rejection as well as the ones which are rejection-free, as the current algorithm. The rejection-free algorithms form a subset of the algorithms with rejection. 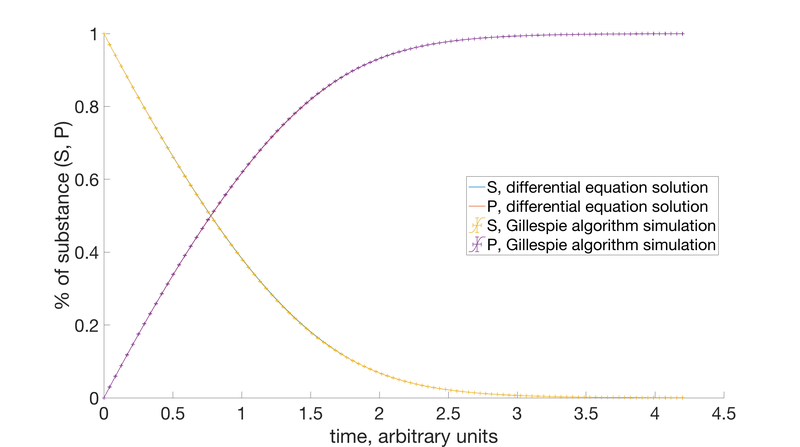 The default Gillespie algorithm was enhanced by two features. If the reaction propensities are known, i. e. they do not have to be estimated, one of the random numbers needed by the original algorithm can be saved. As consequence the longer logarithmic operation is cancelled. See . The search of next reaction is done over the cumulative sum of provided propensities. This search can be enhanced by using memory space. In this case, any of available search algorithms can be applied to the cumulative sum range, which is naturally ordered. In  the binary search algorithm was applied, whereas in the present case, the search policy is managed by the standard library. Often, the algorithm is used for simulation of enzymatic substrate degradation, the common behavior of substance evolution in time is shown in the figure below. There, the comparison is done with the solution of the common differential equations, defined by the Michaelis Menten kinetics. The output is generated by the code below. // ... and exit the simulation immediately. The package provides optional dependency on the random generator of mir.random. This is done by the optional feature of dub, so that this random generator take over, if already present in the project. D. T. Gillespie, J. Comput. Phys. 434, 403 (1976). D. T. Gillespie, 93555, 2340 (1977). S. A. Serebrinsky, Phys. Rev. E - Stat. Nonlinear, Soft Matter Phys. 83, 2010 (2011). W. Sandmann, Comput. Biol. Chem. J. 32, 292 (2008). Copyright: Copyright (c) 2019- Alexander Orlov. All rights reserved.